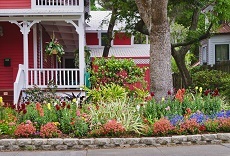 Keeping up your home’s curb appeal shows more than pride of ownership. It shows respect for your neighbors. When or if you decide to sell, a well-maintained home means it will sell faster and likely for top dollar. Similarly, maintaining your home’s interior is likely to pay off in the end. Choosing funky paint colors – Don’t choose an exterior paint color that is too far afield of neighbor homes and stay away from contrasting trim colors that distract instead of attract the eye. Hanging on to old appliances – Pay attention to the age and quality of your kitchen appliances. A stovetop that is too old and scratched to be cleaned properly is a turn-off. In addition, appliances that aren’t energy-savers are costing too much money to run. Thinking too small – A small bathroom will seem smaller when tiled with small tiles than with larger ones. Peruse dêcor magazines for ideas that help to open your space.